Leaders of the five Maa-nulth First Nations met with Scott Fraser, Minister of Indigenous Relations and Reconciliation on Jan. 12, 2018 to sign an agreement that they say will allow them to move forward in their dealings with the province on a government-to-government level. Uchucklesaht Chief Charlie Cootes signing of the agreement is significant because, he said, prior to 2011 government-to-government negotiations meant provincial government to federal government or municipal government to higher level of government. “It’s a great day to solidify our relationship with the province; I think it’s a first step in building a really good relationship that will help keep us away from dispute resolution and implementation issues going forward. It’s a great tool and a great start,” said Chief Cootes. “We have a new relationship today where we have governments negotiating through the Maa-nulth treaty process,” he added. According to a prepared government statement, the new agreement between the B.C. government and the Maa-nulth First Nations creates regular forums to discuss, prioritize and collaborate on topics of mutual interest, including land, resource management and treaty implementation issues. The signing took place at Uchucklesaht Tribe’s new Thunderbird building; a project that was made possible through their treaty, which came into effect April 1, 2011. The Maa-nulth nations are the Huu-ay-aht First Nations, Ka:’yu:’k’t’h’/Che:k’tles7et’h’ First Nation, Toquaht Nation, Uchucklesaht Tribe and Yuułuʔiłʔatḥ. “This agreement is the first of its kind and it won’t be the last,” said Fraser. 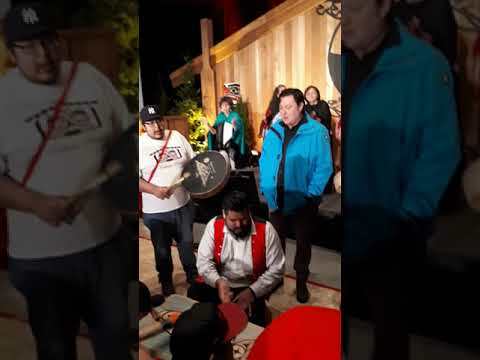 He went on to say that he looks forward to working with the Maa-nulth Nations on a government-to-government basis in a relationship based on the Nuu-chah-nulth concept of hishook-ish tsawak, meaning everything is connected, all is one. The relationship will be one based on recognition and respect, Fraser said. The Maa-nulth treaty recognizes the five nations as owners of treaty settlement lands, giving them jurisdiction over these areas. The new agreement signed on Jan. 12 is designed to help them develop their economies by providing more flexible and practical ways to communicate with other governments. The government-to-government agreement supports improved co-ordination of natural resource development and land management across treaty land and adjacent Crown lands; it will also address issues where provincial jurisdiction applies on treaty land, such as environmental protection, highways, wildlife, or foreshore marine areas. It gives the B.C. government and Maa-nulth First Nations the ability to explore new economic development opportunities, and to address issues related to health, education and social development.